Dan deals in social media marketing as part of his day job, and I’ve worked with stats to a certain extent, but I’m pretty much coming at this as an amateur, so it was interesting working on this together, and challenging each other’s assumptions. We hosted our survey on SurveyMonkey, and we ran it over the 2014 Road World Championships, because we wanted to catch the wider audience, as our stats naturally have peaks when there are events that are easy to watch (and that’s told us some interesting things, over the period we’ve been ‘casting and blogging). We wanted to use the survey to get us answers, and also to get an idea of our social media reach – so we posted it here on our website, on my tumblr, and on Podium Café, where I post a lot, but we mainly publicised it on twitter, and asked a couple of our friends to RT it. We had considered putting out a press release, and posting it on other fora, but we wanted to get an idea of how far we could get with this minimal approach. We opened it on Tuesday 23rd September 2014, when the women’s ITT was on, and we stopped it on Sunday 29th, after the men’s road race. To be honest, we stopped because we’d passed the free 1,000 response mark, and it got too expensive to continue, but it also felt like once we’d hit the 1,500 mark, we were in statistically significant territory, and could be confident our results had meaning. We tried to make it as easy as possible – stressing that people only should answer the questions that they wanted to, and allowing anonymous answers. Our survey was a mix of tick boxes and open-ended questions, so some things are hard numbers, other things have been analysed by hand. We had 1,645 answers over all – because people chose which questions to answer, that doesn’t mean everything is a percentage of 1,645 – but there were at least 1,000 replies to each question, so they’re definitely statistically significant results. 60.58% of respondents were male, 39.42% female. 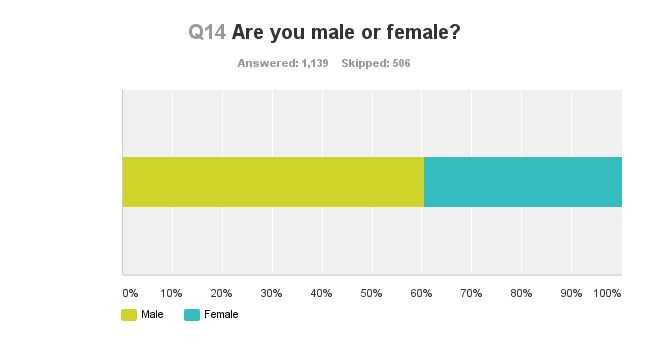 This changed over the life of the survey, as we started off with more of a 55% male/45% female split until we got somewhere near the 1,000 responses mark, when it had spread beyond our networks. That was interesting to watch, and it would be fun to look at it over time, if we ever did, say, a month-long survey. It was also satisfying, as I’ve been told that the cycling/women’s cycling audience is general 80% male, 20% female, so this idea that “women don’t like sport” turned out to be as false as we’d assumed. Obviously this is something we had guessed from our social media interactions, but it was great to see it confirmed. 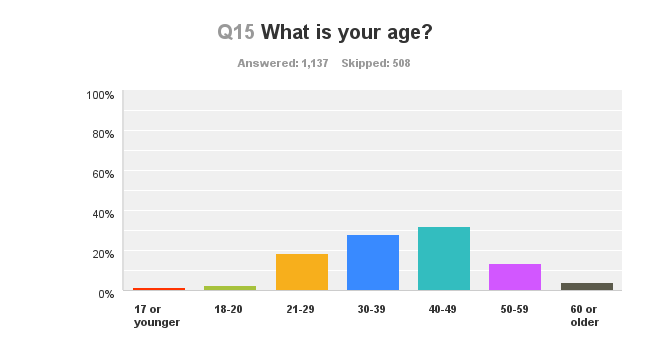 I was a little bit surprised that the biggest group of respondents who answered were 40-49, but maybe that’s also about where we drew the age boundaries? 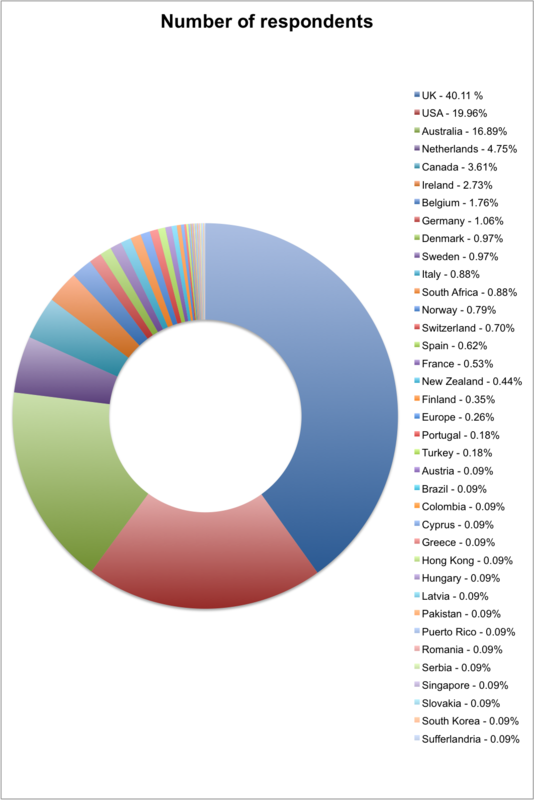 Where did respondents come from? 1,137 people replied to this one, and it’s not really surprising, the country split – I’m British, Dan’s Australian, I tried to hit major timezones in my tweets, but it was an English-language survey, so if I was going to do this again, one thing I’d look at is going into partnership with women’s cycling sites that are French, Spanish, Italian, Dutch and German (as an example), get the questions in different languages, and try to get more of an international flavour. But we always said this was a starting point survey, not a definitive answer. But it’s still interesting to see who we reached this way, and we still have some great numbers in there. The other thing I learned was if I do this again, I’m definitely having a drop-down menu on questions like this, as working out the figures by hand was a long job! 1,440 people answered this question, but they could tick more than one box, so the figures add up to a larger number than that – the percentages are of overall respondents, not the total answers, for eagle-eyed readers who’ve spotted they add up to more than 100%! We also included an “other” box, for people who didn’t fit into one of those categories, or wanted to add supplementary information. 109 people used this, and the answers fall into clusters. 11 people (0.76%) just called themselves a cycling fan, and made the point this was regardless of gender. This had both positive phrasing (“I just love the sport!“) to seeing the idea of diving by gender as negative. 9 people (0.63%) friends/family/fiancé/ex of a pro; 3 former pro riders (0.21%); 5 (0.35%) women who want to start racing, or rather as youths and want to turn pro; 4 (0.28%) were parents of kids who race & want to go pro; 2 (0.14%) specifically watched/wanted to watch women cycling with their kids; and 2 90.14%) women race domestically and both said that if it wasn’t for their age, they’d want to give everything up and go pro. 3 people said they’re women, and relate more to women’s sport than men – and 1 man said he relates far more to men’s cycling because he’s a man. People from other parts of the bike industry included 4 coaches; 3 people who run women’s teams, 3 people who sponsor them; a woman who runs a bike shop with her husband; a woman who’s a bike mechanic; a press officer at a UCI women’s team (“doing it for fun, not getting paid“); and a race organiser. Fan equally of women’s & men’s cycling, but it’s more difficult being the former! TV coverage in America is bad enough for the men, it is non-existent for women. I would watch it if it was available. I actually prefer watching women’s racing, but as you know, can’t see enough of it. I mostly watch men’s cycling, because women’s races are so rare to be seen. (Fortunately UCI Channel provides at least the World Cup races). I’m mostly a fan of men’s cycling, but I follow women’s cycling whenever I can get access. More access = more of my attention. This was a theme throughout the whole of the survey – the single thing people want more of is the chance to see more, but it’s not just the hard-core fans who want more, it’s pretty much everyone. In the next post in the series, I’ll focus on why people said they love cycling – and over the next month or so, we’ll work through the survey, talking about things that struck us as well as the stats – and sharing some of our very favourite comments. If you have any specific questions about any of it, please leave a comment below, or ask me on twitter. I’ve also been inspired by this to start a new social media-based research project – just one question, “when did you get into women’s cycling and why?”, so I can make a timeline or some over kind of visualisation. If you could give me a quick reply, eg “Nicole Cooke in the 2008 Olympics”, that would be wonderful – leave it in the comments, or tell me on twitter. Thank you so much! I’m able to carve out the time it takes to do all this because of my wonderful Patreon supporters – thank you so much, each and every one of you, I can’t tell you how much it means to me. Next: Survey part 2 – what cycling do people follow? I’m sure that I won’t be alone on this one… 2012 Olympic Women’s Road Race. Instant fan. Indeed, one of the reasons I started this was seeing the spikes in the survey of people mentioning it, and I wanted to plot a timeline, and see where the big moments have been – and also to be able to show athletes that they really do count, that even if they’re not racing any more, their legacy lives on. Great stuff Sarah and Dan. Re social media reasearch – Got into womens cycling following Sarah’s section in the eurosport cycling podcast (done by velocast guys) in 2013. Started listening to your podcast at end of 2013 and been addicted ever since! Like Alan I really got drawn in to Women’s cycling from listening to the eurosport cycling podcast & hearing Sarah’s passionate reporting on women’s cycling which drew me in to seek out more. With limited internet & no satellite/cable TV most of my following is through your podcast & blog. Joane Somarriba, Giro d’Italia 1999, etc etc etc! And, just to show, that was my first-ever exposure to a women’s race, that pretty much sums up the lack of any coverage! Then, thanks for the most part to you & Podium Cafe, I learned a lot about the riders (esp. Vos and Evie Stevens). Evie out-sprinting Marianne up the Muur at Flèche Wallonne in 2012 was another eye-opener. The Giro Donne was still another. But what really sealed the deal was the London Olympics Women’s Road Race! That was drama.. and leagues above that farce of a Men’s Road Race the day before (yeah, Vino really deserved that gold-medal.. pptt!). After London, I was hooked! Maybe you need to do another different survey (if it hasn’t been done recently in a proper manner with a wide sample group) that would reach cyclists like myself who don’t watch /follow women’s cycling at this time but maybe moderately interested.